Sticky headers are headers that remain fixed to the top of the website, and are visible even when you scroll down. In a hurry? You can skip to the end and download all the source code for this tutorial from my GitHub repo here. Now let’s get into the code and start making our header sticky! This is just a regular header, so if you scroll down the page, the header will scroll up and off out of sight. 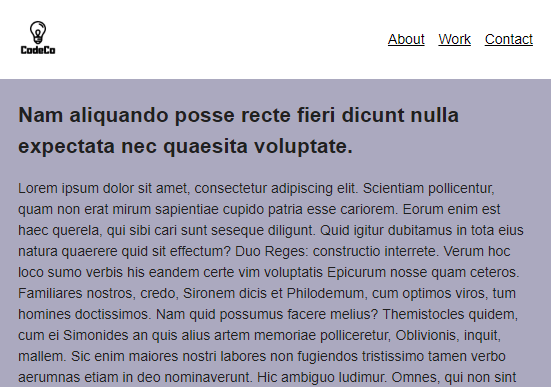 The position: fixed CSS declaration allows you to fix the header to any part of the visible page. Then the top: 0px declaration sets the header to be zero pixels from the top of the page, i.e. at the very top. One note: setting the position property to fixed will make the header element behave very similarly to position: absolute, which takes the element out of the normal “flow” of the page. This means that you will have to manually set a width for the element to make it go all the way across the page. We also had to set width: 100% in order for the header to display the way we wanted. Now if we reload the page and try scrolling down, we can see that the header remains on the page and at the very top, all the time. Nice! However, you can see an issue due to the header being out of that normal page flow, where elements are stacked below one another. The header has the opacity reduced to illustrate the main content underneath it. 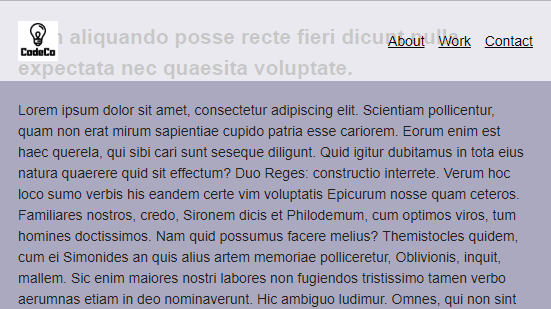 After reloading the page, we can see that the content now displays nicely after the header. We’ve now made our header sticky using CSS! For our next step, we will make it just a little fancy. We want to shrink the header height when you scroll down the page, using a smooth animation effect. You don’t want the header to take up a ton of vertical space all the time, especially for mobile phones which have limited space. Adding a subtle animation improves the user experience and gives your website an extra polish! In the CSS, add styles for this new class to shrink the header height. In the CSS for the default header, add a CSS transition so the height changes with an animated effect. This code will run the checkHeader function when scrolling. However, running functions on scroll events can potentially slow down your website. This is because a scroll event will fire 15 times or more every time you swipe or spin your mouse wheel. If you have a whole lot of code in your scroll function, all those events can add up and ultimately slow down your website. To solve this problem, you can add a throttle function to your scroll event function. This will allow you to limit, or throttle, how often the function gets triggered. The window.scrollY value will tell you how many pixels from the top the user is scrolled. If they’re at the very top, it will be 0. The farther down they scroll, the bigger the number will get. We are also rounding the scrollY value because it will sometimes return a decimal, and I just want to keep it a bit cleaner and use whole numbers. Now, we will create an IF statement to see if the user has scrolled down 100px (a bit past the header, which is 80px tall). If they have scrolled past 100px, we will add a CSS class called “sticky” to the header. If they are above 100px, we will remove the CSS class. A few notes on the above code: document.querySelector is an easy way to find an element, and classList.add and classList.remove are how you can add or remove CSS classes from elements. Now that we’ve added that new “sticky” class, we need to create the styles for it. The header has a height of 40px, and a padding of 20px on each side (top, right, bottom, left). The logo image itself is 40px, so we don’t want to decrease the height itself. 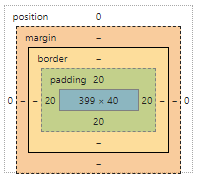 Instead, we can decrease the padding on top and bottom from 20px to 10px. Now let’s move on to the last step, and animate this height change. Add a CSS transition so the height changes with an animated effect. With all the code we’ve added so far, the sticky header will work functionally. Scrolling down the page will reduce the header height. However it will instantaneously jump from 80px to 60px in height, which will look jarring to the user. Adding in a CSS transition will make the height change more gradual, and be much more pleasing to the user. To add this in, we will add a transition property to the default header element in CSS (not the header with “sticky” class). This will ensure that whether or not the header has that “sticky” class, the height change will always be smooth. The first parameter is which property this transition will affect. Since we are changing the padding, we will put “padding” here. The second parameter is the duration of the transition, and we have put 300ms. The third parameter is the speed of progression of the transition. Ease is your standard smooth progressive change. There is a fourth possible parameter to set a delay on the animation, but we are not using it here. Now with the CSS transition added, if you reload the page and scroll up and down, you’ll be able to see the header change in height nice and smooth! Want to see a demo? Check it out on my GitHub page! You can also download all the project files on my GitHub repo here. Thank you for reading (or watching!) this tutorial on making a sticky header. I hope that you’ve enjoyed it and found it helpful!